In a short time Apple has gone from Wall Street's darling to its favourite whipping boy. The tech firm has seen its stock tumble more than 40% over the past seven months despite posting its highest ever sales and profit figures in January. Its second quarter update, due out later this Tuesday, could either restore or further erode confidence. Part of the problem has been weak earnings from some of the firm's suppliers, coupled with a rash of "leaks" suggesting that Apple had cut component orders in the face of weaker-than-expected demand. Chief executive Tim Cook has warned analysts that Apple's supply chain is "very complex", urging them to "question the accuracy" of rumours - but that has not stopped the speculation. Investors' willingness to believe the worst can in part by explained by the rapid rise of Android - and in particular the popularity of Samsung's Galaxy range. Apple's defenders point out that the iPhone-maker's share of tech-hardware profits outweighs its market share, and that sales from the firm's digital stores also outperform those of rivals. But the wider issue is that Apple's stock price had been inflated by the expectation it could repeat past successes with new categories of products, and investors have become impatient. As popular as they have been, the iPhone 5 and iPad Mini are seen as evolution rather than revolution products. As a consequence, right or wrong, it has become fashionable to question whether Tim Cook can match the late Steve Jobs's ability to "think different". With that in mind the BBC asked four company watchers their views about what the firm's research and development teams might be working on - a smart-watch, a major revamp of the iOS operating system, the long-rumoured Apple TV screen and the possibility of something unexpected. There are always rumours, sometimes plausible ones, about Apple's next move. But a smart-watch would be the least risky venture for the Californian computer giant. After all, it has already made an iPod Nano that could be worn on your wrist. A 2011 patent filing suggests the firm has at least considered the idea - but Apple has applied for intellectual property rights to an astonishing array of ideas that never saw the light of day. Yet there are many good reasons why Tim Cook might green-light an Apple smart-watch. It would be less risky than, for instance, launching into the crowded TV market, and investors are crying out for a "revolutionary" new product. But it will need to bring a smart-watch to market that can do for technological wrist-wear what the iPhone did for smartphones, what the iPad did for tablets and what the App Store did for software. All these categories existed before Apple got involved in them, yet its understanding of user-experience and product design consistently left competitors racing to catch up. I suspect Apple's play will be this - it will create a product that defines affordable luxury, aimed at its existing customers - those hordes of iPad, iPhone and MacBook users. It won't be a seen as an essential upgrade - you may remember the head-scratching about what the iPad was for when it launched in April 2010 - but it will both exploit and further engender the loyalty of Apple's army of fans. Crucially, it will almost certainly add fitness functionality for tracking recreational exercise, muscling in on the nascent market inhabited by the likes of Fitbit, Jawbone and Nike - whether Apple will partner with the latter, as it has in the past on Nike+ products is uncertain. The iWatch could also monitor your basic health. And of course it will be a playground for app developers, who have shown themselves to be adept at fulfilling Apple products' latent potential. No company has as much experience of transforming the technological marketplace, especially by reinventing existing ideas. Whether Apple can worry the waters of yet another tributary on the River Tech, notably for the first time without Steve "Midas" Jobs at the helm, remains to be seen. It could, though, and it will almost certainly try. Apple was hugely disruptive to the music and mobile phone businesses and is now disrupting the PC market with the iPad. Is it going to do the same to the television industry? Making predictions about unannounced Apple products is generally a fool's errand, but there's an obvious issue here - what are you going to watch? Suppose you buy a beautiful new Apple television, take it home and unpack it. If you care about TV and live in the UK, you're most likely to be in the half of homes that have pay TV - and so you plug your Sky or Virgin box into the back, switch over to the Sky or Virgin user-interface so you can actually watch something, and never see anything from Apple ever again. So why did you buy an Apple television? The people who own great programming don't want to give up control of it - Sky wants to give you a Sky experience, not an Apple experience. There's no way for Apple to bypass that without buying content - films, football - itself, and it can't afford to outbid every TV company in every country it would want to sell TVs. When you add to that the fact that televisions are an extremely low-margin business - even Samsung only makes a few percent profit - then a TV looks that much less attractive to Apple. In my view that makes doubling down on the current "Apple TV" strategy much more sensible - sell a cheap widget that turns any TV into an Apple TV. The original iPhone was unveiled over five years ago now and since then there has been no major top-to-bottom refresh of iOS. With recent hardware updates being more iterative than innovative, the power of the operating system to make a big impact and generate genuine excitement has grown immensely. Now could the be time for a radical overhaul of the user interface (UI) which has the potential to give users something innovative, fresh and inspiring in their hands again. There has been a ground-swell of opinion within the design community against the skeuomorphic direction of Apple's current interface design. The approach of using real-world metaphors to give the user a familiar reference point can work well when treated with restraint and intelligence. However, Apple's increasing use of wood, leather and metal textures has become surprisingly heavy-handed and tacky. The casino environment of Game Center, with its green-felt background and lacquered-wood borders, is a prime example of this questionable execution, and the stark contrast between the design sensibilities of the software and the hardware. With Jony Ive now at the helm of both human interface and industrial design, I expect the two will align. It will be interesting to see how this plays out with the release of iOS 7. It's unlikely that a potential new look and feel will follow the current "flat-design" trend, particularly as it is tied so closely to Microsoft's Windows 8. I do think that the overly physical elements of the interface design will be pared back and the gaudy textures will be phased out. While this would establish a refreshed visual direction, the UI will need to retain and build on the good things that have served Apple so well in the past. This perceived tactility is not just about aesthetics but about understandable and satisfying interaction, and is unlikely to be underestimated by the master of product design. I'm looking forward to seeing how the two are balanced under this new stewardship. Apple's vice-president of marketing, Phil Schiller, revealed last August that it had considered making a car or re-entering the camera business before it decided to pursue the iPhone. His comments led many to wonder what else the company pursues behind closed doors. It's tempting to think Apple could make the greatest splash by launching something out of left-field - especially at a time when Samsung has confirmed it is "working very hard" on a Galaxy smart-watch, and the market is swamped with smart-TVs. Rumour sites tossing around speculation have suggested Apple might develop an iOS-powered gaming console. The boss of PC games developer Valve, Gabe Newell, threw fresh fuel on those flames in January when he said his industry faced the risk of Apple taking over the living room if others didn't make enough progress. Reports Jony Ive helped design the cartoon robot Eve in Pixar's film Wall-E also suggest the enticing idea he might work on an Apple Android (though Google might take issue with that brand). However, while such speculation is fun, there is one major hitch - chief executive Tim Cook has made it clear that Apple's "laser focus" separates it from the competition. "I think some companies... decided that they could do everything," he told NBC in an interview. "We know we can only do great things a few times, only on a few products." Steve Jobs trimmed Apple's product line-up to a few core ideas when he returned to the company in 1997. 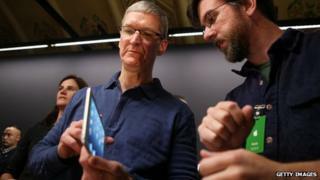 This focus, which Mr Cook seems to share, spurred Apple's innovation and propelled it to global success. If Apple truly wants to stand the test of time, it should continue striving for perfection and avoid becoming a jack-of-all-trades company. Microsoft's Steve Ballmer: Should he stay as boss?